My name is Prism. I am a Veteran and a Guide Writter on SmiteFire, who loves playing smite, mainly in the jungle, solo and support roles ! This is my tenth smitefire guide, so I hope you enjoy it ! Nevertheless, lets move on to the True Avenger, Nemesis! Scales of Fate is a tricky passive. It steals your target's power each time you hit them, converting into damage of your own, for a max of 4 stack, for a duration of 5 seconds. This is why Nemesis Late Game is scary. She can kill anyone with her insane AS and this passive alone. Daelinn made the kind mathmatical formula for this ability, where he describes it has. where X is target's power and Y is your power (or the other way round, doesn't make any difference)- the result will be a "flat", and not percentage amount." ~Daelinn, August 30th of 2016. Swift Vengeance is a pretty simple ability when you read it at first, but when you think about the possibilities this bring to a match, it becomes harder to fully grasp, but not impossible hard, just a bit hard. See, this ability allows you to Double Dash. You can use it twice in the spam of 2 seocnds. That means that you can dash into an enemy, reposition, and hit him again. You can escape an enermy, you can bait an enemy, you can do a lot of stuff with this ability, which REALLY helps in Nemesis' strategic logic and mind-set. Slice and Dice is one of, if not the most important ability on Nemesis' kit. It allows her to deal a ton of ability damage in a big AoE, and, in the middle section of this ability, you get the ability to slow someone caught in it. Very rarely should you miss this, like, once every 3-4 matches. Normally you'll miss the slow if they dash/leap away from you, and they baited you into using this, but if not, then you should really focus on learning how to hit it properly. Retribution is, in my opinion, Nemesis' best ability. It allows her to be a dangerous foe to any enemy. If she times this ability correctly, she can use it to counter a ultimate, to counter a series of basic attacks, and heal from this. This is the most rewarding ability from her kit, and quite frankly the hardest to master. Divine Judgement is a pretty weird but awesome to use Ultimate. It damages the target according to your current HP. This incites the Assassin type of playstyle to Nemesis, to hide while a teamfight happens, use it on the tank, dissapear for a minute, kill the enemies that try to run away, and make bank out of this ult that can shift Nemesis' role from Assassin to Warrior in 1 second. Warrior Tabi is just the best boot for Nemesis. While you do want attack speed, Warrior Tabi is better cuz it gives 20 more flat damage than Ninja Tabi, and that directly affects your Slice and Dice, which is a skill you'll use for lowering the enemy's health, slowing them, and, in some cases, being an execution skill. Also helps a lot in early game farm. Ichaival is an item that, if you're close to me, you should know that I hate it. But why do I use it ? Cuz it works. This gives you an amazing attack speed early game, gives you a great flat penetration, and steals Physical Damage, meaking you a treat to Hunters, Assassins and Warriors. The Executioner will be your 7th item, meaning you will sell Ichaival for this. Attack speed, a passive that syncs with Stone Cutting Sword and just helps you out s lot. Qin's Sais is a item you get third when you're where you expect to be at this point at the game, being anywhere between 0-2 to 3-3. It boosts your damage and gives you an extra, making it worth it so much. Also attack speed ! Frostbound Hammer can be bought earlier if you are ahead, like 3-0 or better. It'll make you the true Slow Queen, and will keep them stranded for a longer period of time, allowing you and your team to kill them easier, or even force them to use Purification in some extreme cases. Frostbound Hammer get's bought in 4th, since you already have a lot of attack speed from Ichaival and Qin's Sais, and this makes your enemy's movement speed get lowered by 30%. It's pretty good to stick to them, something you need on Nemesis. Using this together with Max Level Slice and Dice gives the enemy a 80% slow, so you can see how this is just outstanding. Qin's Sais is a must for the build, so, if you bough Frostbound Hammer before it, now it's time to buy this beautiful pair of sais. Stone Cutting Sword is an item introduced in Season 3, that steals your enemy's protections, just like your ult, and give them to you, just like your ult. It ties to the idea of Nemesis pretty well this item, which I think should be really well used on her. Jotunn's Wrath can be bought instead of Stone Cutting Sword if you want more of a mana and ability based build, rather than a full out auto attack build. It works amazingly on Nemesis, specially the cooldown ! Hide of the Urchin is my go-to defense item on Nemesis. It gives mixed protections, health, mana, and you can stack it up to get even more defenses. It's even the 3rd cheapest item of this build, and it's just so freckin' amazing ! - Farm as much as you can. - Take your chances! Punish enemy jungler when possible! - Kill mid harpies. They yield a lot of XP. Use Wrath to quickly secure it! - Be more aggressive ! - Don't forget to farm and kill buff camps ! - Start Ganking and get kills ! Even if your teammate KS you, be satisfied, you're still putting the enemy behind ! - Take your chances! Try to 1v1 people ! - Use Wrath to steal objectives or stun enemies ! - Farm less, fight more ! - Don't be in the middle of a fight, unless you have the numbers odd. Machups in the jungle role is the key to survival. Understand them, you'll win, underestimate them, you'll loose. | Mostly every jungler god who relies on basic attacks are a easy pick for a well trained Nemesis. Always change basics, use Slice and Dice to be in the advange while she tries to come close to you, pop up Retribution right before her first basic, keep basic attacking her, dash away if need be, and ONLY use your ult if she doesn't have hers up. | This matchup is fun. Bakasura will keep trying to ult you and to basic attack you to death, but all you gotta do is be smart, dash away from him right after he uses he's jump, counter him by using Slice and Dice while he tries to come near, use Retribution when he starts to basic attack and use Divine Judgement for complete anihalation. | Camazotz has no way to interrupt Retribution, and he's a heavily Ability Based Assassin, which is another type of god that get's destroyed by Nemesis. Focus on using Retribution right before Vampire Bats, which is he's biggest damage ability, and focus on sticking to him, since he doesn't have a lot of mobility, except when he uses Bat Out of Hell, but that ain't a lot as well. | Loki doesn't have a good game againts you if you focus him right of the bat. Invading him is an interesting option, and if it's not possible, than just make you can do whatever you can to kill him before level 5. After that, not much you can do since he'll secure kills sometimes better than you through he's ultimate, Behind You!. | Mercury is a really squishy, late game focused god, and a really easy pick for Nemesis. When he activates Maximun Velocity, pop your Retribution in order to deflect all he's basic attack damage back, and focus the **** out of him with your slows. The easiest way to kill him is in a 2v1, which you either slow the hell out of him and allow your mage to do some work, or bait he's Special Delivery and hope that your ally is smart enough to either CCh im or burst him real good. | This matchup is interesting. First off, she has a WAY better early game than you, but you don't have a jump, therefore she can't really fully counter you, and your late game is way better than hers, leading this to be a "medium" matchup. In this case, I recommend getting Hide of the Urchin in the 4th item slot, to help you deal with her ASAP. | This is the most difficult match-up to talk about. These are two gods that I love, one being on level 10 and the other one, on level 07, both are actually neutral to each other, but with the upper hand normally tipped towards Nemesis. However, DO NOT UNDERESTIMATE Bastet, any good Bastet will bait out your Retribution and will procede to kill you without mercy, so be careful around her ! | This is a weird match up. Bellona has the early game, but you can destroy her during late game, if you're smart. Change Retribution for Bludgeon, Slice and Dice for Scourge, and make sure to punish her everytime she makes a mistake. | Fenrir is a really interesting enemy. While he's pretty good in keeping you at bay during teamfights, you can destroy him by using your Divine Judgement while he uses Ragnarok, use Retribution to counter Brutalize, and you've got yourself a deal and a advantage over him ! | All about timing. Counter Sacred Monkey's teleport with a Retribution before he can land a crit, heal up from it, Swift Vengeance away from him if he jumps at you with Somersault, and Purification out of Fear No Evil. Both of you bring enormous teamfight presence, so be careful late game. | You have a better early game, and just a bit worse late game than her. Make sure to capitalize on that early on, and, when she comes near you late game, WAIT FOR HER TO USE Incense, so the stun doesn't break your Retribution and pop it right after to heal up some of the damage, and KEEP ATTACKING HER, or else you'll just die. | Ne Zha is interesting to play againts. Both of you have amazing Basic Attack damage, but if you're not smart, Ne Zha will crit you to death, so make sure to have Retribution ready to survive a crit. Wait until he ults someone else, and use your own ult and bully him, he'll most likely die, unless he's team come to help him. | Ratatoskr will completely DESTROY you early game, but late game, you become the huntress, and he becomes your dinner. He's so squishy just 4-5 auto attacks + Slice and Dice will most likely kill him. But as always, don't underestimate ANYONE in this game. Play smart and late game's yours. | Serqet and Nemesis have really simular playstyles. But Serqet goes to the "Ability Based" route, and Nemesis goes to the "Basic Attack" route. Keep close to her, use Retribution to counter her Deathbane and keep attacking her. She's squishy so you can kill her easily if she's distracted. | *******, this enemy jungler is just horrible. He'll kill you early game with he's bird bomb, and he can do it until like level 15. Retribution should be gotten at level 2, and you need to be really smart to move away from he's combo. If you eventually feed him, just try to avoid him and focus on jungling. | Another difficult freckin' enemy. He'll most likely get fed from you, and just snowball into insanity, so try to stay as far away form him as possible, unless you have really good comms with the mid and you'll quickly 2v1 him early on. Try to exchange Retribution for Storm Kata, and just hope for the best of your skills will bloom and sing to he's defeat ! | Thanatos is a bully. He'll destroy you everytime he has a chance, and he's ult is just annoying to deal with. Although you can counter Death Scythe with Retribution, it's off cooldown faster than Retribution, therefore he can still do a number on you. Watch out for your health bar and don't play 2v1s, specially againts Thanatos and someone else. | Thor is a comfort pick for a lot of people, and he directly counters Nemesis. He has a lot of CC, high-damage close quarters abilities, and you can't really do much about him, unless you catch him by surprise. Pretty difficult Early and Mid Game againts him, so heads up, literaly. ~Daelinn and he's awesome maths ! Nemesis is one of my favorite gods since beta. She was the newest character when I started playing the game, and I remember the Greek Warrior Goddess like she used to be... EPIC ! Well, I hope you liked the guide, so don't forget to leave a LIKE on it and a COMMENT saying how awesome this guide is ! October 22nd, 2016 ~> Guide Published ! October 23rd, 2016 ~> Guide Polishment ! December 3rd, 2016 ~> Guide Update ! This is a really solid guide. covers all the stuff it needs too, brings a little extra and gives a very good idea on how to play Nemesis! i excepted no less from you. Personally, I like rushing Ichaival as a first item with her. Ichaival improves her clear speeds early and her boxing early. she already has great mobility in the jungle with Swift Vengeance, so imo this is worth it. Frostbound Hammer is not as core as The Executioner on Nemesis. Nemesis has a ton of sticking potential anyways, building it is a matter of personal taste. you could keep it on core, but The Executioner as a percentage pen item belongs there as well. Transcendence is something that you shouldn't really get on Nemesis. her waveclear is pretty terrible and it makes Transcendence almost impossible to stack. Jotunn's Wrath is actually amazing on Nemesis because of the fact that her ultimate is so strong in teamfights and ganks. Spirit Robe is really good on Nemesis, as her major weakness is cc and it gives her cdr. Regarding your go to build, it's not my cup of tea with Nemesis because i adore cdr on her and im not a huge fan of Frostbound Hammer on her, but precentage pen should be built once you've got the damage to apply it. buying The Executioner after Qin's Sais could be a good solution to that. Finally, diving the enemy backline after an initation from your tank and you getting your ult off is something you should mention. Overall, Really solid guide, the build isn't really my cup of tea but it's still good and you managed to deliver the information in a really easy to understand way and in a very good way. 8/10, which is an upvote. Try this: Warrior Tabi Ichaival Jotunn's Wrath Frostbound Hammer Hastened Fatalis Qin's Sais. 113083 IceColdPappsi Try this: [[Warrior Tabi]] [[Ichaival]] [[Jotunn's Wrath]] [[Frostbound Hammer]] [[Hastened Fatalis]] [[Qin's Sais]]. All good & stuff, but Ichaival should be switched later in the game, for something like The Executioner or Stone Cutting Sword, and Frostbound Hammer and Hastened Fatalis should almost never be together. Infact, none of these 2 should be on Nemesis to begin with since you already have 2 slows (2 and ult), and a double-dash to chase/escape enemies. Probably better to grab some crit or other, more benefitial power items there. 113089 xZeroStrike All good & stuff, but [[Ichaival]] should be switched later in the game, for something like [[The Executioner]] or [[Stone cutting sword]], and [[Frostbound hammer]] and [[hastened fatalis]] should almost never be together. Infact, none of these 2 should be on [[Nemesis]] to begin with since you already have 2 slows (2 and ult), and a double-dash to chase/escape enemies. Probably better to grab some crit or other, more benefitial power items there. Revised: Warrior Tabi Stone Cutting Sword Jotunn's Wrath Wind Demon Deathbringer Qin's Sais. 113108 IceColdPappsi Revised: [[Warrior Tabi]] [[Stone Cutting Sword]] [[Jotunn's Wrath]] [[Wind Demon]] [[Deathbringer]] [[Qin's Sais]]. Here's what I would do for the "How to Nemesis", in terms of BB-coding. Do note that I'm posting this to help you, and you're not obliged to use. You allready know it's going to have tables in it. This looks a bit better, in my opinion, doesn't it? Again, only an example/trying to help. If you allready had plans to edit that or just flat out want to keep it this way, you can simply ignore this. 112205 xZeroStrike Here's what I would do for the "How to Nemesis", in terms of BB-coding. Do note that I'm posting this to help you, and you're not obliged to use. You allready know it's going to have tables in it. [spoiler=Example] [center][size=5][color=#800080]Early game[/color][/size][/center] [table bgcolor=#800080] [tr bgcolor=#000000] [td padding=10 width=80][center][img height=60 width=60]https://scientiasalon.files.wordpress.com/2015/07/ipad-warped-level-buttons.png[/img] [size=4][color=#800080]Levels[/color][/size][/center][/td] [td padding=10 width=600][center][size=4][color=#800080]Level 1 - Level 5[/color][/size][/center][/td][/tr] [tr bgcolor=#000000] [td padding=10 width=80][center][img width=60 height=60]http://corecocoa.files.wordpress.com/2012/06/any-do-logo.png[/img] [size=4][color=#800080]What to do? [/color][/size][/center][/td] [td padding=10 width=600][center][size=4]- Farm as much as you can. - Take your chances! Punish enemy jungler when possible! - Kill [i]mid harpies[/i]. They yield a lot of XP. Use [[Wrath]] to quickly secure it! - Stay safe! [/size][/center][/td][/tr][/table] [/spoiler] The code for this is: [spoiler=Code] [code][center][size=5][color=#800080]Early game[/color][/size][/center] [table bgcolor=#800080] [tr bgcolor=#000000] [td padding=10 width=80][center][img height=60 width=60]https://scientiasalon.files.wordpress.com/2015/07/ipad-warped-level-buttons.png[/img] [size=4][color=#800080]Levels[/color][/size][/center][/td] [td padding=10 width=600][center][size=4][color=#800080]Level 1 - Level 5[/color][/size][/center][/td][/tr] [tr bgcolor=#000000] [td padding=10 width=80][center][img width=60 height=60]http://corecocoa.files.wordpress.com/2012/06/any-do-logo.png[/img] [size=4][color=#800080]What to do? [/color][/size][/center][/td] [td padding=10 width=600][center][size=4]- Farm as much as you can. - Take your chances! Punish enemy jungler when possible! - Kill [i]mid harpies[/i]. They yield a lot of XP. Use [[Wrath]] to quickly secure it! - Stay safe! [/size][/center][/td][/tr][/table][/code] [/spoiler] This looks a bit better, in my opinion, doesn't it? Again, only an example/trying to help. If you allready had plans to edit that or just flat out want to keep it this way, you can simply ignore this. Quick question: Are you supposed to keep Ichaival or swap it late game? You don't mention swapping it anywhere but Ichaival falls of late game, and your passive pretty much replaces that of Ich. Perhaps Wind Demon could do for a nice replacement. 112209 xZeroStrike Quick question: Are you supposed to keep [[Ichaival]] or swap it late game? You don't mention swapping it anywhere but [[Ichaival]] falls of late game, and your passive pretty much replaces that of Ich. Perhaps [[Wind Demon]] could do for a nice replacement. Hha I see what you're getting at. Okay. 112215 xZeroStrike Hha I see what you're getting at. Okay. Well done. However the "How to Nemesis" part has like, no BB-coding. So maybe try something to spruce it up. Like an image on the side or something. "He's" means "He is". Example: "Have you met the new guy? He's really cool". "His" means "something that he owns or is entitled to him". Example: "Is this yours or dad's watch?" "It's his." Small word, but a whole different meaning. Other than that, good guide. 112204 xZeroStrike Well done. However the "How to Nemesis" part has like, no BB-coding. So maybe try something to spruce it up. Like an image on the side or something. Also, I'm saying this not to make you feel bad, but to help you, it concerns your English: "He's" means "He is". Example: "Have you met the new guy? He's really cool". "His" means "something that he owns or is entitled to him". Example: "Is this yours or dad's watch?" "It's his." Small word, but a whole different meaning. Other than that, good guide. 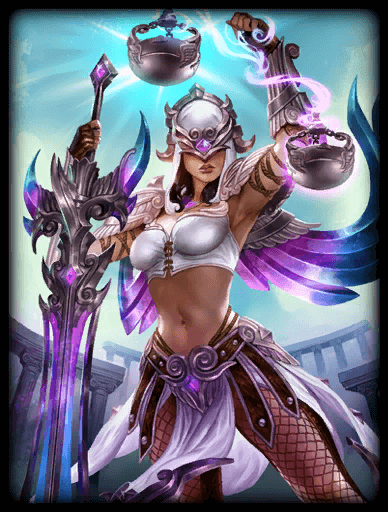 Nemesis= SMITEWAIFU! Guide wise, can't really judge you on it because I don't play her, but you might wanna go more in depth on the other items not mentioned in the final, just in case others pick them up. 112201 IceColdPappsi [[Nemesis]]= [color=#ffff00]SMITE[/color][color=#ff0080]WAIFU! [/color] Guide wise, can't really judge you on it because I don't play her, but you might wanna go more in depth on the other items not mentioned in the final, just in case others pick them up.